Tim Burton's reimagining of Disney's 1941 animated classic Dumbo has failed to dazzle many film critics ahead of its release on Friday. The Guardian's Peter Bradshaw gave the film one star, calling it "pointlessly complicated and drawn out". In his two-star review, The Daily Telegraph's Robbie Collin said it "has to be counted as a failure". Thandie Newton's daughter Nico Parker makes her film debut as the daughter of Farrell's former circus star, taking a shine to the big-eared baby elephant. The Hollywood Reporter's David Rooney declared his new version of Dumbo a "frustratingly uneven picture" that "holds the attention but too seldom tugs at the heartstrings". Variety's Owen Gleiberman said it "transforms a miraculous tale into a routine story by weighing it down with a lot of nuts and bolts it didn't need". Other critics found it more endearing. Empire's Ben Travis awarded it four stars, calling it "an enchanting blend of Disney twinkle and Tim Burton's dark whimsy". However, Peter Bradshaw's Guardian review called it "a flightless pachyderm of a film that saddles itself with 21st Century shame at the idea of circus animals". While admitting there were some moments where Dumbo "teeters on the verge of flight", those moments were "cancelled out by boredom, as the pointlessly complicated and drawn out story grinds on to its tiresome conclusion". 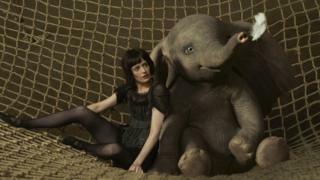 In the Telegraph, Robbie Collin wrote that, while the elephant "looks great", the "remake never gets off the ground". Collin noted that the 2019 version is twice as long as the original and is filled with "modish new themes to fill the time, including animal cruelty, makeshift families and corporate exploitation of artists". He concluded: "A Dumbo remake that fails to jerk tears has to be counted as a failure." "This Dumbo story does occasionally fly - but only just." Jamie East's three-star review for The Sun said the remake "has all the darkness we expect from a Disney film", such as death, abuse and bigotry. But he said it lacked heart. "It's as if Tim Burton kept forgetting to be Tim Burton and felt like he should be making The Greatest Showman 2," he wrote. "Having said that - It looks utterly glorious. The animals are perfectly rendered and the Art-Deco universe is splendorous."